So, to catch you up with the story thus far, we left La Paz under clear skies on the 18th of November, and cruised between the islands north of La Paz. Once again the Sea of Cortez continues to overwhelm with beauty and bountiful sea life. The next day we had good wind and zipped up the channel to a beautiful crescent-shaped cove in Isla San Francisco, shown at the top of this blog entry. This is a small island 44 nautical miles from La Paz and surrounded by the dramatic Sierra de la Giganta mountain range that literally springs from the sea and creates dramatic sunrise/sunset photo opps. We hiked across the steep range overlooking the bay, and were circled by ravens, hawks and what appeared to be vultures, all riding the upwelling drafts. Our next port of call was a small fishing village called San Evaristo (population: 20 Indian familes) where we intended to buy some fresh fish for the grill. En route, we caught a nice Bonito and based on this luck, decided to turn around and head south again. (Note to Dad: we had been having no success fishing with a cedar plug on our new hand-line, until I decided to switch lures to the one we used on the coast of Baja...within ten minutes of this switch, we had the Bonito in the cockpit and proceeded to filet ourselves a nice dinner. We now call the plug you brought our "magic lure")! We used our new gaff-hook to bring the fish aboard, carved off a few tasty portions, and cleaned up the bloody mess, then pointed Hurulu back south and motored through exceedingly calm seas. The sky was overcast-- the first since entering Mexico-- and we welcomed the relief from the intense Baja sun. Shortly after, Naomi shouted out "WHALE" and we saw a pod of 6 to 8 just off the starboard bow. We slowed the motor and ran parallel to them for a bit, trying to capture them on film (Editors note: whales are hard to photograph as you never know when they will surface). Finally, when an estimated 40-60 whales had finally passed us by, we fired up the trusty Yanmar diesel and continued south back to Isla Espiritu. We dropped the anchor in a small cove that we had all to ourselves called Ensenada de la Raza, but after I dove on the anchor, I found it was not digging in to the bottom---we had to keep moving, back to the familiar Bahia San Gabriel. Once stationary, anchored in about 18 feet of turqouise water, we opened a few Coronas and grilled up our Bonito at sunset, half with butter and garlic and the other half marinated in Soy Vey. Muy delicioso! Which brings us back to the present, tied dockside once again in La Paz. While it's fun to have real showers then stroll the seaside malecon eating choco-crunch helado, I'd much rather be back at a remote anchorage where we have the silence and stars all to ourselves. In short, the Sea of Cortez is truly a special place...it is hostile, harsh, and mysterious, yet it is teeming with life both day and night...my favorite activity while anchored is to simply sit on the bow under the quarter moon and just listen to the sea. It's so much fun because the sea is very much alive...mammals are constantly surfacing and breathing around the boat, and fish are frequently jumping out of the water for reasons known only to them. Gulls are omnipresent with their dramatic dive-bombs in search of a meal, and even here in the marina there is a goose named Lucy who was apparently cast off from her gaggle in a storm and never left...she makes the rounds of the boat in search of a snack, and sqwaks loudly if you don't comply. And despite the harsh, empty seas and islands, it's a healthy place to spend some time. We're both developing a nice glow (despite constant use of SPF 50+), and with days spent swimming, snorkeling, pulling up anchor by hand (a great upper body workout), a little fresh fish here and there, amazing sunset cocktail hours, and a lot of sleep in a gently rocking boat, we're both in the best shape of our lives. Ok, enough for now. Tomorrow we leave again for the islands and will join our new friends from the boat La Palapa for an island Thanksgiving. After that, we will make the rather long crossing over to Mazatlan and points further south. Asta luego! Just a brief one today, as we're casting off the docklines and heading up to some islands north of La Paz. 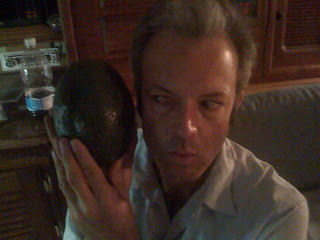 This was a fun discovery at the local mercado...an avocado nearly as big as my head! After the awards ceremony, parties, etc, we left the hubbub and fracas of Cabo and headed up the Sea or Cortez for a couple days of sailing en route to La Paz. Our first stop was a very chill little bay called "Los Frailes" which took us the better part of an entire day/evening to get to. We again anchored successfully in the d ark and passed out. The next day, we fired up the dinghy and outboard and cruised around the corner a few miles to a bay called Pulmos for some snorkeling and R&R. This was a very cool, very chill bay, almost empty save for a few hardy souls who had arrived by 4x4, and was recently designated as a national marine sanctuary. As we laid out the sarong on the sand and had a PB&J picnic, we had one of those moments where we looked at each other and wordlessly shared the sentiment of "yeah, this is what we came here for...this is what it's all about." Note to adventurous readers: if you need serenity and a place to get away from it all, this is the place to do it, and you should do it now. Apparently developers have their eyes on this area, and unless the economy continues its freefall, in a few years this will likely be covered in condos or at a minimum, hotels. At the moment however, it's just empty sand, great reefs for snorkeling, and a few palapas on the beach. Perfectamente. Our next day had us sailing up to "Ensenada de los Muertos", where we dropped anchor and again passed out early. The following day turned out to be the real action. After rounding the protective headlands of Muertos, we were faced with monstrous 10-12 foot swells and 20+ knots of wind. We needed to sail upwind through this mess. I took the first shift, and was enjoying bashing over the waves so much I stayed at the helm for about 6 hours. I got into a rhythm of turning the boat into a swell, then pivoting at the top, analogous to the way a mogul skier pivots on top of a bump. Eventually Naomi relieved me and I laid down on the floor of the cabin to rest. The winds and seas continued to build and each time we launched over a particularly big wave, it sounded like the boat was exploding, and of course my boat-hypochondria-worry-angst was in high gear with each foreign sound. Day turned to night and the wind and waves continued unabated. The VHF radio chatter at this time was interesting, as other boats making the same passage were having various engine problems, etc. Eeeee-ven-tu-al-ly, we got some wave protection when we entered the lee of Isla Espiritu, but after trying to reach an anchorage, we realized we had to keep sailing on, toward a small bay called Balandras. Finally, we reached it, dropped the hook, and got some rest. After such a wild day--which started at 5:30 am and didn't end until midnight, or roughly 18 hours of "bashing" (and being bashed), it was rewarding to wake up in this beautiful little cove. We snorkeled around El Hongo ('mushroom rock') and made pancakes for breakfast, then set off for Palmira Marina in La Paz, a short 12 miles away. Which brings us up to the present. We spent all day yesterday cleaning the massive salt deposits off of Hurulu-- owning a boat is basically a constant battle against corrosion, rust, mold, etc.-- and then Roger, a friend and fellow Ha-ha-er on the boat La Palapa, came by at sunset for margaritas, grilling steaks, and a few rounds of Yahtzee (Roger won). +Anchoring in daylight is for wimps: We are feeling very proud of ourselves given that every time we've anchored this boat--save for one time in bahia santa maria-- it has been in the dark. However, this bravado was quickly humbled when we pulled into our slip at the marina and nearly took out two very large concrete posts. +Our fellow cruisers seem to like to motor a lot: We get a lot of kudos from fellow boaters when they learn we sailed the entire way here. Apparently, most just motor North from Cabo, into the prevailing winds and seas. This is perplexing to me, given that most sailboats are pretty poor powerboats. We can go a lot faster under sail than we can with the diesel, even if it means zig-zagging in long, broad tacks. Or perhaps they just have more powerful motors? 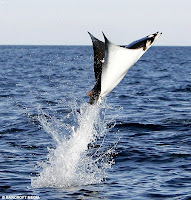 +Manta rays are cool: We saw no dolphins or whales this trip, but during a particularly hectic moment, a manta ray flew 6 feet out of the water, flipped twice, and landed back in the drink. Was this for fun, or was he escaping a predator? Who knows, but pretty exciting to see. +The Maltese Falcon is following us: Ok, given that it sails at like 24 knots and w e average about 5, technically I suppose we're following them. The maltese falcon, in case you are unawares, is the world's largest sailing yacht at 289 feet, owned by VC Tom Perkins. When we left our slip in sausalito on October 15, we motored right past it en route to the GG Bridge. Then, off the coast of Baja, we saw a large white shape which turned out to be the Falcon as it got near. Naomi even radioed them and flirted a bit. Finally, as we pulled into La Paz, it was anchored just outside the channel. Apparently Tom has a submarine on it that he's going to use to follow the migrating whales....cool! Ok, that's it for now....time to go polish some chrome and stainless steel. Let me repeat that, because even as I write this, it still seems somewhat unreal: "We made it!!!" At exactly 9:32 am on November 6th, we crossed an imaginary finish line running between latitude 25 degrees, 52 minutes north by longitude 110 degrees, 08 minutes west. To pick up where we last left off, we departed San Diego in the early morning hours on October 27th for the start of Leg One of the 15th Annual Baja Haha "Cruisin to the Cape" sailboat rally. On board our vessel Hurulu was me Nathan (Captain), Naomi (Skipper and Navigadore), my brother in law Cyril Vidergar and my father Dr. Bruce. The race began at 9 am under cool, misty, and foggy conditions as approximately 160 boats all jockeyed to cross the starting line simultaneously. We kept pace with a 40 footer for a couple of hours, which was fun (a primary determinant of boat speed is boat length, in that longer = faster...so it's encouraging to go "as fast" as a longer boat). We had 350 miles to go to reach the first stop, Bahia de Tortugas (Turtle Bay). By mid day, the pack had thinned out considerably, as faster boats pulled ahead and as particpants chose different routes. We opted to head well offshore on the theory that the wind dies down closer to the coast. To be fair, it is rather disorienting to be cruising along in the fog, in a moonless (read: pitch black) night, with only 10-15 feet of visibility. But once you're in this situation, really the only thing you can do is to stay calm, be alert and vigilant, and keep moving...which is exactly what we did. By dawn, conditions had lightened and we were again on our way. Over the next two days, things took a slow and casual pace, as the wind often died completely and the seas turned to glass. It's actually pretty cool to be 100 miles out of sight of land in perfectly calm seas...the ubiquitousness of the color BLUE is calming and beautiful. But alas, we were in a race to reach Turtle Bay, so we turned on the motor. Motoring in a sailboat is, frankly, pretty boring. Sailboats are designed to sail, which makes them rather poor motorboats. So, we steamed along at 4-5 knots (roughly, about 6 miles per hour, or a brisk walking pace) for the next 2 days. Eventually we reached Turtle Bay at 2:30 in the morning, and I am thrilled to report that the team of Beckord, Beckord, and Vidergar executed a flawless anchoring (which amazingly, was the first time we had EVER anchored this boat!!!) We then all slept for about 14 hours, exhausted. Turtle Bay is kind of cool in it's own "coyote ugly" kind of way, with about 1000 residents and about 1000 pounds of dust covering every car, shack, sign and fencepost in the area. The Ha Ha crew hosted a party on the beach, which was ok, but nothing too thrilling. After a day and a half, we were back on the high seas and headed for a small bay called Bahia Santa Maria. This was around 250 miles south by southeast. Again, we headed out to sea, both to avoid the 160 other boaters, and to pick up some favorable winds. Wind we wanted, and damnit if it wasn't wind that we got. After the "Dead Calm" conditions of Leg One, we were blasted for 3 days straight. Don't get me wrong-- this is FUN, and we had a definite advantage over SoCal boaters, since we are used to the constant 20+ knots of wind on SF Bay. 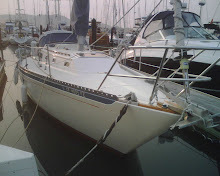 However, when sailing SF Bay, we can rip around Angel Island then safely tuck back into Sausalito Yacht Harbor and go out to a nice dinner, out here-- 80+ miles from land--- when the seas kick up to 14 feet and the wind hits 22 knots there is no place to go. The only option is to ride it out, even if it lasts for days. My personal highlight of the trip was during the last portion of Leg Two. We each had two three-hour shifts per day. Mine was 3-6, meaning I did an afternoon shift and a very early morning shift. During my 3 am shift, we jibed and turned the boat East into a dead-on beam reach. It's worth stating that the fastest and most efficient point of sail on a boat is a beam reach, where the boat is roughly perpendicular to the wind, and the sails are flaked out about 45 degrees to the side. During those early hours, from 3 to 6 am, I had my first authentic bonding experience with Hurulu. She absolutely FLEW over the waves, at sustained blasts of 8.2 knots...all the while taking in stride the large swells and breaking waves hitting her astern. Anyway, once dawn broke and Naomi took over her shift, things calmed a bit, until we were all jolted awake with shouts of "WHALES!!!!" 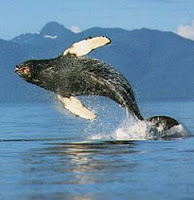 We were being trailed by an entire pod of huge whales, species unknown, but these guys were nearly as big as our boat. The most exciting (and terrifying) moment was when a huge whale was headed directly across our path. We were going 7 knots and he was probably doing the same...we are about 14,000 pounds and he is probably several thousand as well...not a happy thing. I started blasting the horn and he must have dove under our boat. I still wonder-- what in the hell happens when you hit a whale? Certainly, neither party fares well. Eventualy we reached Bahia Santa Maria and dropped the hook (aka anchor). This is a beautiful, desolate spot on earth, and the next day we enjoyed a great party on a bluff overlooking the bay. Due to a rather annoying dispute with the vendor of a faulty autopilot (long story), we opted to leave early for the final leg-- onward to Cabo. At about 150 miles, Leg Three was the shortest of them all, and we continued to have g ood wind. Again we headed offshore, sailed south and east, then BLASTED due east to round Cabo Falso and then the famours Cabo "Arch", after which we dropped anchor near the marina. Which brings us to the present. As I write this, I'm sipping a 7&7 and we are about to head out to the Awards Cermony. Tomorrow morning, our crew (dad and cyril) head back to USA and Naomi and I will take Hurulu up to La Paz for a while. I hope to update this again from there. +Flying fish are annoying-- as fascinating as they are, they are also a real nuisance. The reason? They fly up onto the boat at the most inopportune time, and then die. The other thing is, they absolutely STINK. Really. Really stinky. And they shed there scales all over the place. After my 8.2 knot 3 am sail, the next morning they we had something like 5 flying fish lying dead on the decks. +Flying fish can be funny-- as long as the joke's not on me. Cyril was sleeping in the cabin when a flying fish flew through the companionway and landed on his chest. He felt something wet and slippery and warm and thought the boat had sprung a leak. Then the leak started to shed it's scales all over him and stink up his shirt. Not fun for him, but still...pretty funny. +Dolphins are freaks of nature, but I absolutely freakin' love 'em. So, just like flying fish are fish that want to be birds, dolphins are mammals that want to be fish. which would normally also make them freaks of nature, if it weren't for th efact that they are SOO darn COOL. They visit our boat almost every day, and they "play around with us"...they swim under the boat and surface, and cruise along with us for awhile. Also, one of the coolest moments is when we saw roughly 150 dolphins all jumping out of the water at the same time. I kid you not. I took some grainy video of it, but there was a whole pod (school? swarm? gaggle?) of them diving and flopping together. I think they were stirring up a school of fish or something-- not sure, but very cool to watch. +I still can't believe we almost hit a whale-- there must be 8 billion square miles of open ocean on this planet, but somehow we came within 5-6 feet of hitting a masive whale. Heading dead on into the path of an oncoming 6000 lb piece of flesh is one of those moments of decision that the sailing books don't really prepare you for...can he see us? hear us? sense us? We heard anecdotally of a guy who knew a guy who knew a guy that hit a whale, and it was a big bloody mess...not the kind of thing I would wish on anyone. +Fishing can't be this easy-- During the trip down, we wanted to fish. Now, I know next to nothing about fishing, so I tasked my brother Brian and my dad to figure out what we needed in terms of gear, poles, tackle, etc. During Leg two, we decided to break out the pole and give it a go. My dad and cyril found a lure, carefully studied the knots book to tie it to the pole, and started to drop it overboard. I kid you not-- no less that 3 seconds after the lure hit the water, we had a Yellowtail hooked, and I could see other fish following it. We let out less than 6 feet of line. We got it up on board, hit it with a hammer, fileted it, and marinated it in Soy Vey. A few hours later, we gorged on an amazing meal. I am REALLY stoked to be fishing on this trip. +And finally, the "crew of Hurulu" was awesome...Cyril rocked our world by being so helpful, and his Eagle Scout training came in handy numerous times. My Dad became a skilled salty sailor by the end of the trip, and said he's ready to "do it again". Naomi was par excellence on the navigation front, as well as adept at handling the boat in heavy weather. Did I mention she looks outstanding in a bikini as well?